Once when the play 'Pavalakkodi' was staged at Karaikudi, Sri A.AL.RM. Lakshmana chettiar, who was then quite a big shot in those parts and Sri K.Subramaniam, lawyer turned director, happened to watch the play. They were highly impressed at the acting and singing skills of MKT and S.D.Subbulakshmi. They immediately decided to film the play and booked both the artistes for the lead roles. A fee of Rs.4000 to MKT and Rs.2500 to SDS was paid and the production of the film started in Meenakshi Cine Studios at Madras. During the filming of this movie, one of the partners to the production wanted to quit. He started to give all sorts of problems to the production which even took the form of blowing his car horn loudly to prevent the song recording !! Bhagavathar immediately gave a fair share of his money to him and settled the issue. The vast stretch of land which is occupied by Sathya studios and Sathya Engineering college next to Tamil Isai Kalluri at Adyar today was once upon a time a big vacant land without trees. When K.Subramaniam and AL.A.RM.Lakshmanan chettiar decided to film Pavalakkodi they chose this spot for the shooting and the spot was named as Meenakshi Cine Tone. MKT himself spoke about his first film experiences in an interview in 1949. The following is taken from that interview. MKT, being a newcomer to the film world had practically no knowledge about film picturisation. K.Subramaniam had to explain everything to MKT. Although he nodded his head as if he had understood everything, in real fact he could not understand anything. He simply obeyed the instructions of K.Subramaniam and acted in the film. Scences in Pavalakkodi were shot with the help of the bright sun light. White lead tin metal sheets were used as reflector of sunlight. Royal palace sets were erected there and the shooting was carried out. Bhagavather's first scene was a song sequence. The meeting of Arjuna and Subadra was the first shot MKT acted and he sang his first film song, 'Soma sekara' on that day. 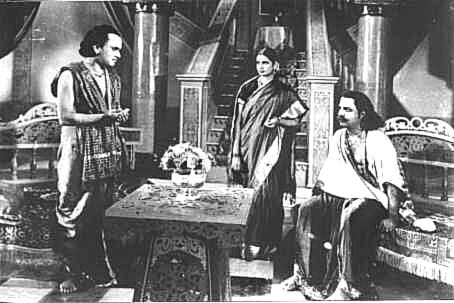 Sundarambal (not KBS) acted as Subhadra. Film industry in those days was in the primitive stage and there was no facility to record the songs separately in a studio. 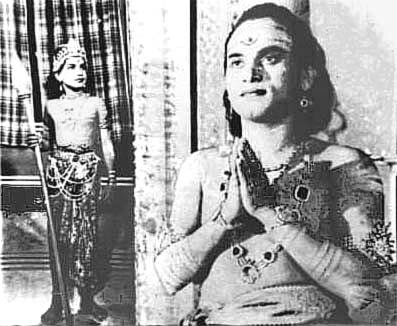 Bhagavathar was asked to sing and act at the time of the shooting of the scene itself. He learnt about the film industry to some extent only in his subsequent films, Naveena Sarangadara and Chinthamani. 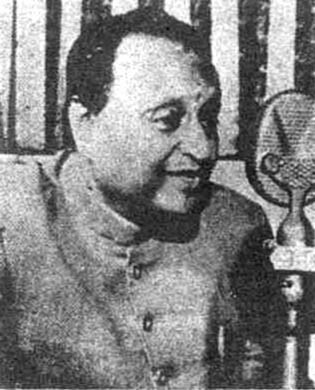 During the early fifties a studio was constructed in the place of Meenakshi Cine studios and was named as Neptune studio and the name was changed to Sathya studios when it was purchased by the late MGR. This film was released in 1934 and has about 50 songs out of which 22 were sung by MKT. Papanasam sivan, the great composer, made his entry into films through Pavalakkodi. This was the beginning of the Sivan-Bhagavathar combination and the saga of their success continued till the demise of MKT in 1959. The poster and the song book of Pavalakkodi captioned MKT as a Sangeetha vidwan. The film was advertised as containing 50 songs ! MKT plays Arjuna in this movie and S.S.Mani Bhagavathar, a close relative of Papanasam Sivan, plays Lord Krishna. Almost all those who used to act in the stageplay feature in this film. 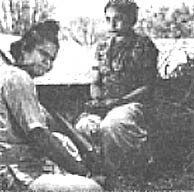 The leading female artistes are S.D.Subbulakshmi and K.K.Parvati Bai. Songs by MKT in this film, 'Soma sekara' in Kharaharapriya, 'Kanna Kariyamugil Vanna' in Bhairavi, 'Vanithaikkul uyarvaana' and 'Munnam oru sanyasi vadivakki' became super hits and widely sought after songs. Naveena Sarangathara, a superhit film, was also directed by K.Subramaniam and has the same pair, MKT and SDS, in the lead roles. S.S.Mani Bhagavathar also features in this film. This rather queer name 'Naveena Sarangathara' comes from the fact that the movie was made with some modifications to the traditional stageplay, 'Sarangathara'. K.Subramaniam included in this film the song 'Gnana Kumari' which was originally from the 'Valli Thirumanam' play. Since there was another movie called 'Sarangathara' in the same year and also due to the changes made, this movie was the modern version, 'Naveena Sarangathara'. As expected,'Gnanakumari' in Devagandhari, 'Abaratham Seithariyen' in Rasaali and 'Sivaperuman krupai vendum' in Surati became very popular. Even after so many years the song 'Sivaperuman kripai' retains the same charm ! 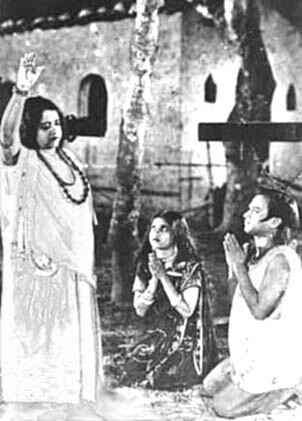 Indubala who plays the sanyasini has sung a couple of hindi songs in this film, 'Krishnaji krishnaji' and 'Mere to giridhara gopal dusara na koi'. The film was advertised with a special mention of the group dance performed by Miss Komala and party from calcutta ! During the same year, another movie with the same story titled 'Sarangathara' and featuring Kothamangalam Seenu as Sarangatharan was produced by Bombay Wadia Movietone. But the movie did not do well. This picture is considered till this day as an all time great in south Indian films. The movie fetched the producers very big money with which they constructed a cinema theatre in their hometown Madurai and named it 'Chinthamani'. The story is about a Sanskrit poet called Bilwamangal who hailed from Varanasi. Bilwamangal, a renowned scholar, gets attracted to Chintamani, a woman of ill fame in his town, which changes his lifestyle. He neglects his wife, Suseelai, and the dying father. But Chintamani nourishes a deep devotion to Lord Krishna in her heart and laments for what destiny had decreed on her. Soon Chintamani teaches Bilwamangal the path of devotion and he turns into a saint. He wrote the famous poem in praise of Lord Krishna called 'Krishna Karnamrutham'. 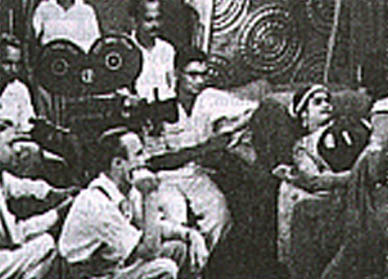 Chintamani was shot at Devadatta Studios, Calcutta. 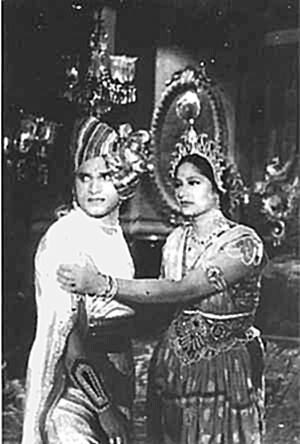 The film introduced a kannada speaking stage actress, K.Aswathamma. The pair, MKT and Aswathamma, became very popular. 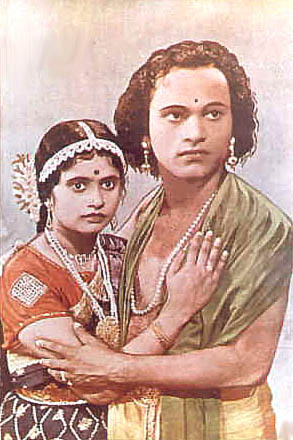 Aswathamma had a very short span of life as she died in 1939 due to tuberculoses. Apart from Chinthamani she acted only in one more film called 'Santa Sakkubai'. Chinthamani was the first tamil movie to run over one year ! Y.V.Rao, who has directed the film, wanted to do Bilwamangal's role. But he had to concede to Aswathamma's demand that MKT should do the lead role. 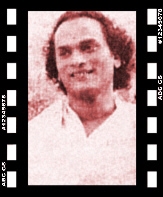 Y.V.Rao plays the role of Manoharan, the friend of Bilwamangal. MKT is tailor-made to the role of Bilwamangal and has portrayed the different facets of the role with ease. L.Narayana Rao, as Alwar chetty, has done a good job for the comedy share of the film. The film contains some of the all time great hits such as the catchy 'Maya prapanchatil' and 'Pesum taramo kaadal','Bhajanai seyvom kannan namam', the very popular 'Radhey unakku' in Chenchuruti and 'Gnanakkan ondru' in Jonpuri. The other songs by MKT include 'Arpan unnaiye' in Mukhari, the short but classic 'Thinai pozhudu' in Saveri, 'Sakalamum avane' in Useni and 'Kasturi tilakam' in Mohanam, a slokam from Krishna Karnamrutham. Besides these, the songs 'Naadagame ulagam' in Kamas by Serugalathur Sama and songs by Aswathamma such as 'Krishna Krishna Muraye keleer', an adaptation of the popular hindi song 'Suno Suno', 'Eena jenmam eduthen en iyyane' and 'Divya darisanam tharalaagaatha' became superhits. The gramaphone records of 'Maya prapanchathil' and 'Bhajanai seyvom kannan namam' were given by Thurayur Rajagopala sarma and not by MKT Bhagavathar. MKT Bhagavathar rendered 'Radhey Unakku' and 'Gnanakkan ondru' on record. This film elevated MKT to superstardom. He became the first superstar of Tamil cinema. Kalki, in his review, wrote that the film has made such an impact on the viewers that the housewife would sing Mayaprapanchattil while preparing coffee in the morning and her musical or unmusical husband would sing 'Rathey unakku kobam' to please his sweetheart!! MKT himself produced this picture. 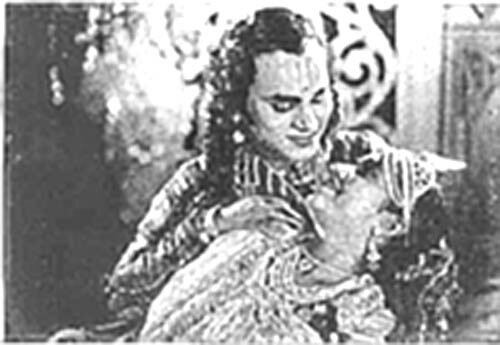 The heroine is Devasena, who later married the great singer M.M.Dandapani desikar. MKT plays dual role in this film, the king and the court singer. The film contains excellent songs namely 'Udyogapattamellam' a ragamalika, 'Rajayoga gnanaguruve' in Kharaharapriya, 'Sollupappa' another ragamalika and 'Thaamadamen swamy' in Thodi(a concert song in the film) and the movie has an english note too. 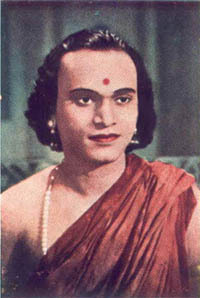 Of these songs, 'Thamadamen Swami' was popularised by the great singer G.N.Balasubramaniam in his concerts in later years. The song 'Sollu Pappa' was originally written as 'Sollu pappa, sollu pappa, suthanthiram pera vazhi sollu pappa' but later the lyrics was changed owing to objection from the British authorities. Ambikapathy thrilled the viewers purely by its music and the onscreen portrayal of romantic love between MKT and M.R. Santhanalakshmi. Needless to say, the movie was a box office bonanza. The producers initially wanted to hire Y.V.Rao as the director. But the success of Chinthamani seemed to have created a big ego in Mr.Rao. He treated the producers disrespectfully besides demanding a fabulous amount as his fees. The producers dropped the idea and approached Ellis R. Duncan. Dungan, after hearing the story, immediately agreed to do the direction. The romantic scenes of MKT and MRS in the classic love story were intimate and daring in those days. Dungan portrayed the love sequences in the same style as that of Romeo and Juliet. The film also introduced Elangovan as the dialogue writer. His dialogues created history. The Bhagavathar-Sivan-Elangovan trio became very famous and was considered the best choice for box office successes. N.S.Krishnan and T.A.Madhuram have acted in this movie but their characters are not related to each other. While N.S.Krishnan does the comedy sequences, T.A.Madhuram features as the Princess's maid. Serugalathur Sama as Kambar and P.B.Rangachari as King Kulothungan have done a neat work. C.Honnappa Bhagavathar, a musician from Karnataka, T.S.Balaiah and S.S.Rajamani also feature in this film. 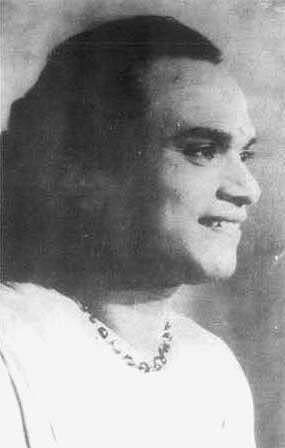 P.G.Venkatesan, who was popularly known as the 'K.L.Saigal of south India', features infrequently and his songs 'Aadavan udiththaan' in a Hindustani tune and 'Kallamilla kaadal' in Behag were hits. Honnappa Bhagavathar has given a concert-like song 'Unnaiyallaal Gathi yar' in Kalyani. Thyagaraja Bhagavathar used to sing this song in his concerts. This film contains everlasting songs by MKT such as 'Ulaginil Inbam' in Simmendramadhyamam , 'Ini yevvaaru' in Sama, 'Chandrasuriyar' in Mandu, 'Maane naan unnai adaiya' in Punnagavarali, 'Enathirai arutcheyal' in Danyasi, 'Pathi padam panivathu' in Shankarabaranam, 'Bhajanai seivai maname' in Behag and 'Satre charinda 'in Shanmugapriya. After the success of Ambikapathy, MKT's photographs began to adorn the walls of cinema theatres, bungalows, hotels, tea shops, clubs and other places all over the tamil speaking provinces and other countries where tamilians live. His magic voice spread into the ether and the bewildered audience stood enchanted as they forgot their worries listening to the melodious songs. His songs were hummed by all classes of the society. This is the familiar story of one of the sixty three tamil savants of Lord Shiva, Thiruneelakanta nayanar. Wonderfully directed by Raja Sandow, Thiruneelakantar was a great success and contains immortal songs and brilliant acting by MKT and Seragalathur Sama. The acting skills of MKT revealing the 'bhakthi bhaavam' (devotion to God) in the fullest measure continued to dazzle in the subsequent films, Sivakavi and Haridas. 'Yanai' Vaidhyanatha Iyer, who got that name for his big appearance (seen in the photo on the right above), was MKT's personal secretary till the demise of MKT. Songs by MKT in Thiruneelakantar include the popular duet song 'Unnazhagai' in Brindavana Saranga (or Manirangu ? ), the scintillating,classic and unimitable 'Pavalamaal' in ragamalika(Bhairavi,Kalyani and Manirangu), the exemplary 'Chidambaranatha' in Hemavathi, the fast paced 'Characharangal' in Boop, the enchanting 'Orunal oru pozhudu' in Kamas, the elevating 'Neelakanta Neelakanta' in Poorvikalyani(or Hamsanandi? ), the mellifluous 'Maraivai pudaitha' in darbar, the catchy 'Deena karunakarane' in Navroj and a few other less known but memorable songs such as 'Pannagendra Bhushana', 'Eesan kaanmino' in ragamalika(Yaman kalyani, Punnagavarali and Sindu bhairavi), 'Adi devane' in Kurunji, 'Sakala bhuvana nayaka' in Kedaram and a catchy duet song with S.S.Rajamani, 'Manam ninainthu magizhnthen' in a hindustani tune. The songs in this movie were appreciated not only by the layman but also by carnatic musicians such as Maharajapuram Viswanatha Iyer, T.N.Rajarathnam pillai and a score of others. One particular incident related to this movie is worth mentioning here. T.N.Rajarathnam Pillai, the doyen of nadaswaram, was a very close friend of MKT. One day, he played a Bhairavi alapana in his nadaswaram and posted a query to MKT if he could reproduce the same effect in his voice. MKT brought out the same effect in the song 'Pavalamaal' much to the surprise and delight of T.N.Rajarathnam pillai. Although this bit of Bhairavi is not found on the gramaphone record rendition, it can be found in the film track of the song. Many consider this ragamalika as the best by MKT. T.N.Rajaratnam pillai makes a brief appearance in this film (as well as in the film 'Rajamukthi'). He has acted in the lead role in the movie 'Kaviraja Kalamegam'. Thirunelveli Pappa plays the heroine's role. Serugalathur Sama excels as Lord Siva. Kothamangalam Subbu plays his part to perfection and S.S.Rajamani features as the devadasi. NSK, T.A.Maduram and T.S.Dorairaj team up for some of the most hilarious sequences. 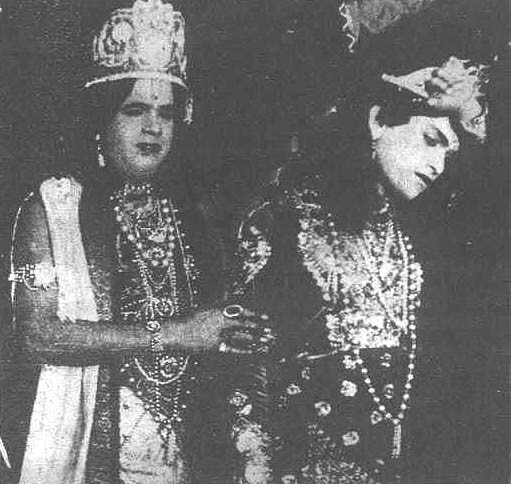 S.R.Radhakrishna Bagavathar (who belonged to Kittappa's troup and trained MKT for the role of Narada in the 'Valli Tirumanam' play) appears as one of the 'thillai vaazh andanargal'(temple priests of Chidambaram). As expected, Ashok Kumar was a roaring success. 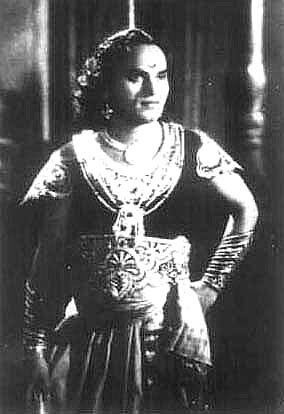 It introduced Kannamba to the tamil screen. Although her mother tongue was telugu, her dialogue delivery is clear and the pronunciation accurate. T.V. Kumudini has done the heroine's role. Chittoor V. Nagaiah plays Emperor Ashoka and Nagarkoil Mahadevan has done a commendable job by his natural acting as Budha bikshu (Budhist monk). MGR, then a younster, makes a brief appearance in this movie as Mahendran. NSK and T.A.Maduram join together in the movie for some appreciable comedy sequences. The vast vacant space seen in the 'Sathvagunabothan' song is today the busy and flourishing Thiruvanmiyur area in Madras ! The songs in this movie include some of the finest gems by MKT such as 'Manila vazhvu' in Kalyani, 'Dhyaname Enathu' in Kapi, 'Unai kandu' in Bhairavi, 'Sathvaguna bothan' in jonpuri, 'Van pasi pini' in Sindhu bhairavi', 'Maname nee' in Kunthalavarali, 'Bhoomiyil manida' in Sindhu bhairavi, 'Unnaiye anbudan' and 'Sinam Kamam' in ragamalika( Shankarabharanam, Purvi kalyani and Mohanam). All the songs stand as ample testimony to Bhagavathar's command over carnatic music. 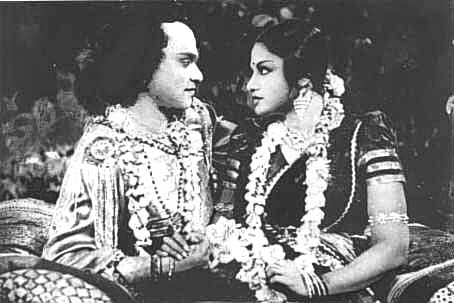 The duet song with Kumudini, 'Ullam Kavarum' is an adaptation of the famous hindi song 'Piya Milan Ki' by Pankaj Mallick. The tune was slightly improvised in the Charanam by G.Ramanathan to suit the high-pitched voice of MKT. 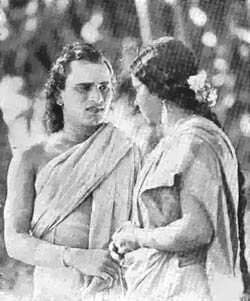 The other song with Kumudini is 'Kidaiyaathu Vaazhvithile', also in a hindustani tune. This film was directed by Raja Chandrasekhar. G.Ramanathan and Alathur Subramanya Iyer, guru of MKT, have done the background music. 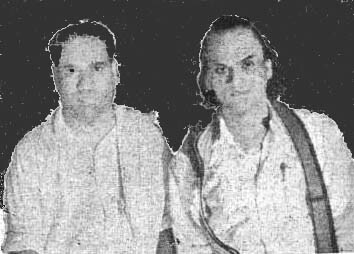 The Bhagavathar-Sivan-G.Ramanathan-Elangovan team continued in Bhagavathar's subsequent pictures, Sivakavi and Haridas. Many films in those days had more than one title. 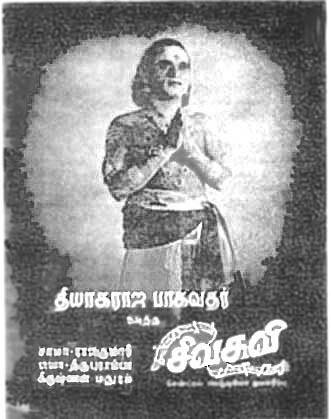 'Poyyamozhi pulavar' or 'Sivakavi' was another superhit. It further reveals, just as the earlier movies did, the exceptional ability of MKT to sing pure carnatic music in a way the common man could relish. who derives that name from a boon by the mother goddess, the presiding deity of Vairapuram. He is initially opposed to singing in praise of Lord Muruga but later undergoes transformation through Muruga's grace. 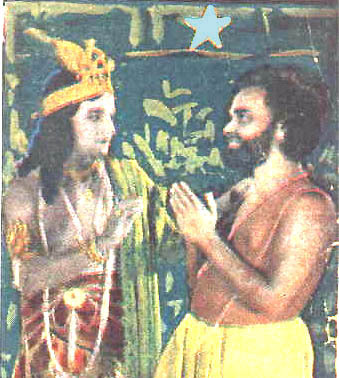 The popular 'Vadaname chandra bimbamo' in sindubairavi, the rare gem 'Manam kaninde' in Ratipatipriya, the duet song 'Vasantha ruthu' in ragamaliga, the everlasting 'Amba manam kanindu' in Panthuvarali, the 'ninda stuti'( censuring prayer)'Vallalai padum' in chenchuruti, the sweet 'Thamiyen painthamil' in Sahana, the classic 'Ellam sivan seyal' in Thodi, the short but superb 'Kulirntha mugamanum' in Kharaharapriya, the dance song 'Nattiya kalaiye' in Natakurinji, the well known 'Soppana vazhvil' in Vijayanagiri Bhuvanagandari and the finishing song 'Sri Kalyanaguna' in ragamalika still echo in the hearts of ardent MKT fans. Apart from the above songs, there are a few more short pieces in classical ragas such as the song in Kurinji, 'Thiruvarul thara innum' and a few other songs which go on to make Sivakavi a memorable musical treat. was intended to be included in this film but neither the song was pictured nor was it released as a gramaphone record. It was during the making of this movie that MKT was very actively associated with the propogation of Tamil Isai through the newly started Tamil Isai Sangam. The first few words in the enchanting song in Sahana are 'Thamiyen Paintamizh annaiyin paal arunthi thavazh baalan, thamizh valara uyir vaazhum oozhiyan endru ulagariyum' (I am the humble baby which toddles after having drunk the milk of mother tamil, the world knows me as a worker who lives for the growth of tamil). These words were written by Papanasam Sivan according to the storyline of the movie but were more than mere coincidence to MKT's real life. An interesting anecdote relating to the making of Sivakavi. Papanasam sivan was writing the songs for this movie. 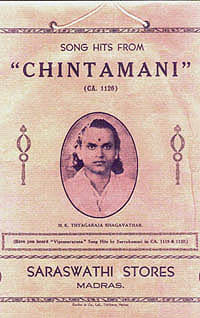 He wrote a song in the raga Sindubhairavi, Mugam adu chandra bimbamo. 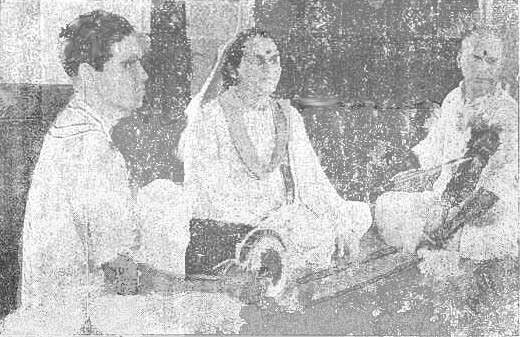 When the song was recorded, the song sounded as 'Muhamadu' chandra bimbamo. When this was pointed out by MKT and others, Papanasam Sivan immediately realised that Mohamad has no role to play in the life history of Poyyadamozhi pulavar and changed the words as Vadaname chandra bimbamo which became a super hit afterwards ! This film was directed by Sriramulu naidu. 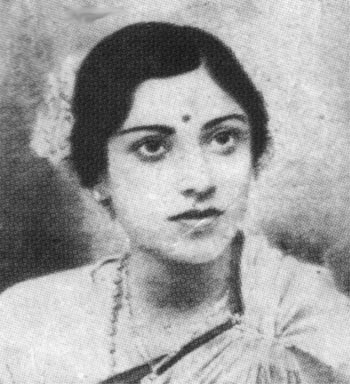 S.Jayalakshmi, the sister of the great veena vidwan S.Balachandar, does the heroine's role. N.S.K., T.A.Madhuram, Pulimootai Ramasamy, D.Balasubramiam, P.B.Rangachary, T.R.Rajakumari, Serugalathur Sama, M.S.Tripurambal, Madurai Venkatesan, a disciple of Ariyakudi Ramanuja Iyengar, S.Rajam, S.Jayalakshmi's brother and S.Jayalakshmi's father (as the patasalai guru) feature in this movie. 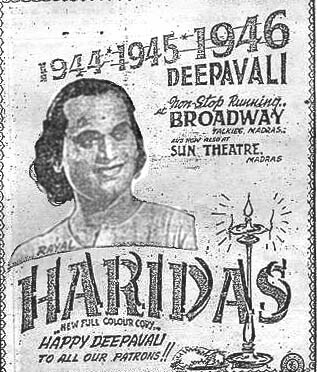 Haridas had an unbreakable record run of over three years in the same theatre 'Broadway' at Madras and became the eternal favourite of millions. The picture ran through three deepavali festivals and created an unprecedented box office hit. N.C.Vasanthakokilam, who was held as matching in her skills to the great M.S.Subbalakshmi herself, has done the heroine's role. The regular feature of MKT films, the comedy track of N.S.K., T.A.Maduram and Pulimootai Ramasamy are not missing in this movie. P.B.Rangachari, T.R.Rajakumari and Nat Annaji Rao, father of the late Haridass Giri, also appear in this film. The horse which is seen in the opening song, 'Vaazhvilor thirunaal', is MKT's own ! The song, 'Manmada leelaiyai vendraar undo' in charukesi became an unparalleled hit and is considered as the best song ever in that raga. It even attracted the appreciation of the great Semmangudi. This film also contains 'Ennudal thanil' in ragamalika (Yadukulakambodi and Atana) which was the favourite of the late M.G.Ramachandran. The unforgettable 'Annayum thandayum' in Manolayam, the everlasting 'Krishna mukunda' in Navroj, the precious 'Nijama' in Bekada are the other well known hits. It is almost solely by his golden voice that MKT established an unbreakable record in the form of Haridas. 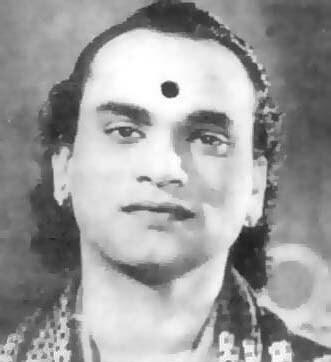 N.C.Vasanthakokilam has sung a couple of beautiful songs namely 'Kathiravan uthayam' in Bilahari, 'Yenathuyir naathar' in Mayamalava Gowla and one more song in a hindustani tune. MKT and NCV sing a duet song 'Thottatharkellam' in Sindhu Bhairavi and MKT and T.R.Rajakumari sing a duet song 'Ennalum intha' in ragamalika. A song by NCV, 'Kanna vaa manivanna vaa' was recorded for this film and was even released as a gramaphone record but the song was not picturised. Haridas is an unusually short film compared to the length of films in those days because at the time of making Haridas, there was a ration for motion picture film reels due to World War II. This short but superb film was neatly directed by Sundar rao Nadkarni. From out of the profits earned, the producers floated the Madura Knitting Company in Madurai and brought out the Lion brand vests in the market !! After the release of this picture, MKT's fame rose to a limitless height. He was by then the highest paid star. He gave the producers the maximum return for their investment and the audience utmost satisfaction. His remuneration went up to Rs.One lakh and more from this picture. He was the first male star to receive such a huge sum as remuneration. His voice was considered the best suited one for the microphone. During that time he acted in the play 'Bilhanan' for one of the programmes in AIR, Trichy. The play was a very big success. A German sound engineer was doing the recording. He, after hearing MKT's voice, said that MKT does not have merely a golden voice but a gold mine in his throat ! MKT was booked at that time for as many as twelve films namely 'Raja yogi','Sri Valli', 'Sri Murugan', 'Valmeeki','Udayanan', 'Bilhanan ','Bhaktha Metha','Jeevakan ','Kalidas', 'Nambiyandar Nambi',' Vidhyasagar' and'Meyporul Nayanar'. A few songs were also recorded for each of these films. Rajayogi (AVM Productions) was almost completed. It was then that some so called respectable personalities plotted against him and dragged him into the murder case of the editor of a yellow magazine (called Indu Nesan), C.Lakshmikanthan (For more information on the murder case please visit the Biography-Page 3 section ). Unfortunately, due to the tragic drift in MKT's life, these movies are lost forever to MKT fans. Bhagavathar was honest enough to return all the money which he received as advance from the producers. These films were completed with other stars in the lead role. 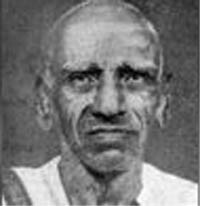 T.K.Bhagawathy once said that Bhagavathar has sung eight songs for Rajayogi which are very good. 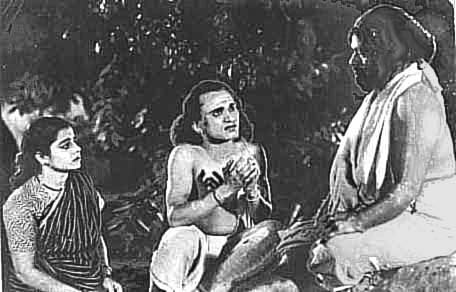 Although the songs recorded for the above pictures have not been released as gramaphone records, one song by Bhagavathar, 'Mukundane Nandan Maindane' in Subhapanthuvarali was used in the film 'Vikata Yogi' starring P.U.Chinnappa.